London Underground (LU) like the New Age Steppers can truly proclaim to have been there at the very beginning of On-U Sound. For it was they that occupied the opposite sides of On-U Sound's first release (ON-U S1(1)), LU taking the B-side with a track extolling the virtues of educating yourself in foreign tongues - 'Learn A Language'. They were also part of the first On-U live shows that Adrian Sherwood saw as the cornerstone of musical activity for his newly founded label. In their four or so years of existence, like all On-U 'bands' of the time the line-up of LU was fluid, but retained a focus around Kendall Ernest (bass), Martin Frederix (aka Martin Harrison) (guitar, bass, vocals), Pete Holdsworth (vocals, melodica) and Danny Sheals (drums). There were numerous guest appearances - perhaps most notably from Dr Pablo (aka Pete Stroud) and Kishi Yamamoto (at the time Adrian's co-director of On-U). "...aside from the appetising smack of their 'Watching West Indians In The Cold' 10", this is the first real proof of the group. Aided in their task by the macabre melodica machinations of [Dr] Pablo, ... 'At Home With The London Underground' is an eerie stroll through surreptitious vocal incantations and aspirate saxophones. Again, just one play is enough to realise their contentious and acute slant on the seamier aspects of dub. I'm not quite sure where they fit in between African Head Charge and The Dub Syndicate but it's around there somewhere. Together these two records are each other's antidotes and in their own right make compulsive listening." "['Current Affairs Session'] develops many of the themes and ideas established on the debut LP ... as well as exploring new ground. Material featured on this LP roughly falls into two categories; tracks like 'Rise And Fall' and 'Between The Lines' were developed during live performance, and although both have been re-structured to suit studio work, they remain essentially well-rehearsed and well-loved 'show songs'. 'Motivation' and 'Animosity' on the other hand, were recorded in a more spontaneous fashion. The overall sound being built up with layers of rhythm and instrumentation, relying to a large degree on improvisation and intensive writing and re-writing on the spot. Most of the work done on these tracks was done in the studio with the tape rolling. 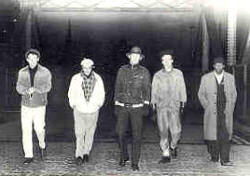 The rhythms on the new LP incorporate many new ideas and techniques, and whilst maintaining traditional London Underground values of 'hardness' and drive, etc., attempts have been made to free the rhythm section from the strict 4/4 dance tempo, and yet retain the all important elements of swing and 'dance-ability'. Lyrically this LP and its companion seven-inch single take much more of a direct, hard approach than any previous work so far. In short both records have more punch than ever. They are different. This is London Underground tougher and harder than ever before. And with Ade Sherwood at the mixing desk what more do you want?" It was a bold statement - but apart of the 'Compilation 80-84' CD (ON-U CD7) released in 1990 that featured both LPs in whole, that was the last LU material committed to wax. Over time band members drifted off into other projects; Martin Frederix went on to form the Fellow Travellers with his brother Tim, fellow ex-On-U stalwart Jeb Loy Nichols and Jeb's wife-to-be Lorraine Morley. Most recently he became a sound engineer for the much coveted Jamiroquai. Dan Sheals was also involved in various projects by Michael Wadada's Suns Of Arqa. An On-U newsletter did report that an 'On-U Sound Extravaganza Live In Tokyo' album featuring London Underground was going to be a 1984 "big seller", but no catalogue number was ever allocated or anything else heard about the release. We can therefore only assume that it was either never recorded or its comprising material lies forgotten, deep in the On-U archives. Pete Holdsworth's friendship with Adrian Sherwood lead around 1994 to them forming a partnership and setting up the now highly respected reggae reissue label Pressure Sounds, which within a couple of years he took complete control of. He also now manages the Green Tea imprint - perhaps most well known for licensing releases of the Japanese dub-reggae band Dry & Heavy for the UK. Despite their significant place in On-U Sound history, LU releases have been largely and deliberately left off the reissue list - making virtually everything they released hard to find and prized to own. Pete Holdsworth, casting a rightfully critical ear over his yesteryear output, is not impressed with LU's recordings and as a result has rarely sanctioned Adrian the right to reissue his old material. Listening back now to the sounds of London Underground over 20 years since their creation, perhaps he is right, the music hasn't aged as well as its peer recordings. But as some great philosopher has surely uttered, "...you don't know where you are until you know where you've been...", and therefore in a musical development sense, London Underground are as much a part of what built the sound we know of as "On-U" as any Creation Rebel album before it did or any Little Axe album since.